A slipped disc can occur whenever one of the discs of the spine ruptures and the gelatinous material inside it leaks out. The material of the disc will put pressure on the nerves or on the spinal cord itself. This usually leads to back pain as well as pain in different areas of the body like the arms or neck. This type of pain is very common among people who are between 30 and 50 years of age. It is more common in men than in women and a study conducted in the UK shows that a third of the male adults suffer from back pain and that 1 in 20 of those cases is the result of a slipped disc. What is Slipped Disc Surgery? There are other options for those whose back pain is minor. They can overcome it with therapy and medication. However, there are a lot of cases when the pain prevents the sufferer from performing his daily activities. In these instances, the best solution is surgery. There are multiple methods available, although most of them involve removing all or part of the slipped disc. An open discectomy is a procedure where an incision is made in the spine and the disc that is causing problems is removed. A prosthetic intervertebral disc replacement involves cutting out all or part of the disc and replacing it with an artificial one. 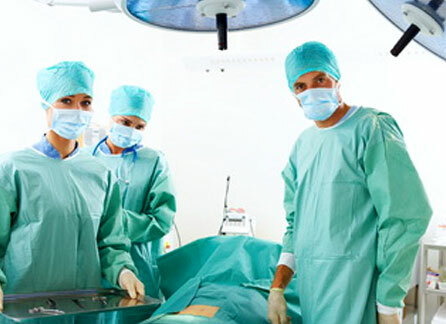 Another operation called an endoscopic laser discectomy involves using a laser to cut out the disc. However, this procedure is still new and only performed by experienced surgeons under careful supervision in special circumstances. Whatever the method that the surgeon uses his goal is to go in and remove all or part of the problematic disc. First, the patient is placed under anaesthesia. This can be general or local, depending on where the slipped disc is in the spine. After that an incision is made so that the surgeon can access the disc. Once it is located the compressed nerve that is causing the back pain will be released. Finally the surgeon will cut out all or part of the slipped disc and either insert a prosthetic inside or leave it like that. Either way the remaining parts will start fusing together. This is usually a safe procedure with low chances of unpleasant side effects like bleeding, infections or nerve damage. The average recovery period after this kind of surgery ranges from three to six weeks. However, there are some whose symptoms do not pass and that will require further surgical interventions. This type of operation is covered by the NHS. However, for those that want to reach out to a private clinic to perform the operation they can expect to pay around £13,000 to £15,000. This number can increase drastically if the patient will need further procedures or extended periods of recovery time. If you do decide to have this kind of surgery, use a professional. They might cost a little more, but clinics like Ramsay Health Care and the London Bridge Hospital offer the best services that money can buy.